In 1972, Paddy Starling gave up farming in the robust Eastern Lowveld of Zimbabwe and devoted himself full time to painting. 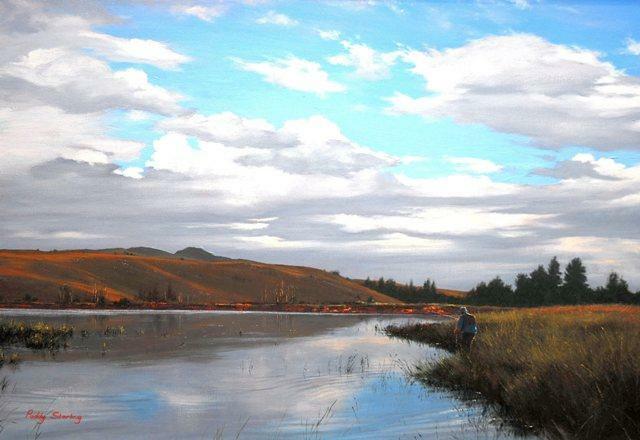 Today, he is arguably one of South Africa's most popular and sought after land- and waterscape artists. Water is the endlessly intriguing focus for his landscapes, particularly the tranquil stretches of rivers beloved of fly fishermen. Looking at Paddy's waterscapes you can almost smell the sweet, decaying scent of the river and glimpse the shadow of a trout in the clear brown water. Paddy finds the accurate rendition of water fascinating and challenging, not just painting it, but seeing through it, putting the riverbed, the reflections and the flowing movement onto the canvas, all resulting in super-realistaic depictions. He personally visits and photographs every scene he intends to paint in order to capture the light, the atmosphere, the surroundings, and the feel of the location. This contributes to a Paddy Starling masterpiece every time he puts paint to canvas. Paddy's more than thirty solo exhibitions sold out every time and his commisions range from past South African State Presidents to national and international corporate clients, various prestige hotel groups and local as well as international private collectors.